Cross-Strap Latex Dress. The strap crosses at the back. Hem is tulle/net and only available in black or red. 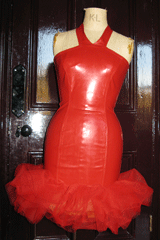 Latex 0.45mm	All colours with black tulle or red.